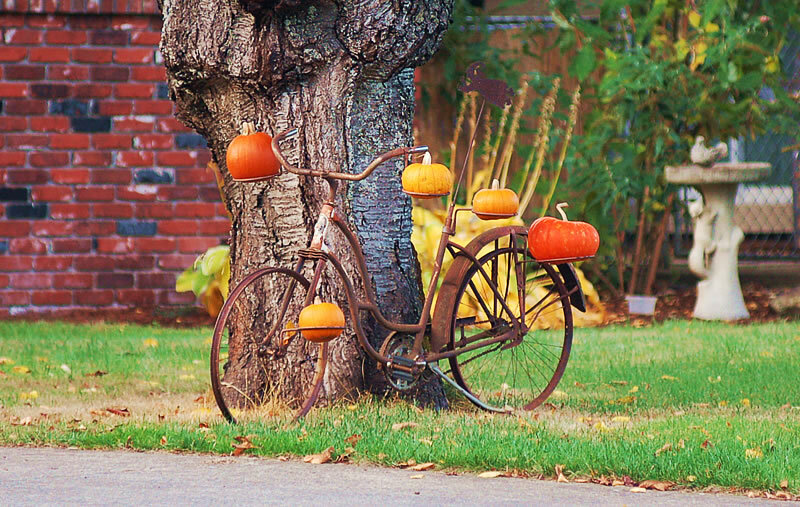 A bike adorned with pumpkins in October. Photo: PacificPedaling.com. The other day I went out on the Saturday morning yard sale crawl in quest of superb finds and other delights. It was an especially early one since the ladies at the local DAR were starting their sale at 6am. But like the rest of the “pickers” there I was, combing for goodies. I finished by 6:30 and had to wait an hour and a half until the next sales in town, which were slated to start at 8. But there was one sale that started at 7, out in the nearby countryside. So, even though it was further than my typical ventures — a conservationist doesn’t drive far often— I headed out. That sale turned out to be mostly a bust, but the ride out there was the real treasure. Daylight was just breaking over the lovely Shenandoah Valley. A first frost had hit the hay bales and fading grass, bathing everything in twinkling, luminescent light. The beauty of this place always surprises because, depending on the time of day, or season of year, it’s equally beautiful but utterly different. The one thing it seems to hold in common is leaving me with the impression that it’s not too far from what it must’ve looked like when first settled. Sure, we could quibble over power lines and cell phone towers and yes, I wish they didn’t blight the landscape, too. But, since the perfect is the enemy of the good, I see and want to see all the beauty still there, especially at this time of year. Especially at dawn. One particularly arresting sight happened just about a mile out of town, reminding me again how close we are here in the magical town of Staunton, Virginia, to our local farmers, and a long history of farming. Most cattle farmers around here have Jerseys if they’re a small scale dairy, or maybe Holsteins if they milk more. The beef cattle are often Angus or Reds. But on this morning, in a meadow speckled with dew, astride a stream flanked by autumnal trees, sat a large group of Charolais, or white cows, each with their legs and hooves tucked under their bodies, making compact figures scattered across the lawn. They seemed to be in some kind of humble reverie, or perhaps communing with one another. It was such a beautiful sight. And though that vision wasn’t outdone by anything else I saw on the drive out to the quaint village of Middlebrook, plenty of gorgeous vistas, waving hills, and tucked away corners of God’s paradise competed for the prize as most astounding landscape. More than a few people grouse that, in today’s society, we rush the seasons. After almost a century as a wholly corporatized America, it’s clear that pushing retail sales takes precedence over actually experiencing the holiday or season itself. That’s why when we’re bombarded with flyers and catalogs for Halloween costumes and decorations beginning the day after July 4th, we’re pretty burnt out on it when Oct. 31st finally comes. Same goes for now with the Christmas assault. Retailers may need the hard sell to survive, but we people may need the soft experience to survive. But really, it’s finally October. The leaves are finally turning here in Virginia, the days begin with frost, crest into a shocking blue sky, searing yellow sun, and clearness as far as the eyes can see, punctuated by that in-between space where the season of abundance gives way to the quiet glories of the season of dying back. And I don’t need to bundle up yet, at least not before sundown. And though I’m grateful, I don’t want turkey yet. And I can’t go sledding yet so I don’t want Santa yet. It’s October, finally. And I just want October.